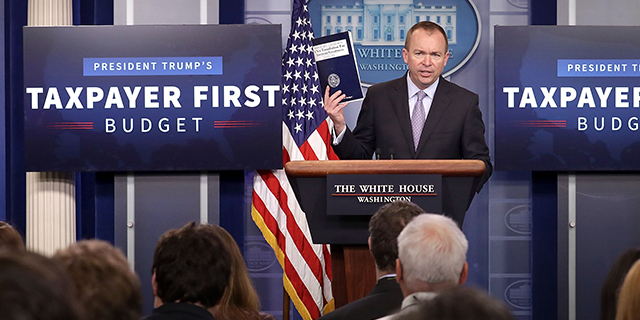 President Donald Trump’s first budget request to Congress would make deep cuts to government programs, including Medicaid, the health insurance program for low-income adults and children. Recent polls have found little public support for cuts to Medicaid, but that may not be a surprise: Americans tend not to favor budget cuts when asked about specific areas being affected. In April, only 12% of U.S. adults said they wanted to see the president and Congress decrease spending for Medicaid, according to a survey conducted by the Kaiser Family Foundation. Four-in-ten said they preferred to increase Medicaid spending, while 47% said they wanted funding levels to be kept about the same. Public reluctance to cut federal funding is not limited to Medicaid. In an April Pew Research Center survey, majorities in both political parties said they favored maintaining or increasing spending in nearly all of the 14 specific budget areas that respondents were asked about. 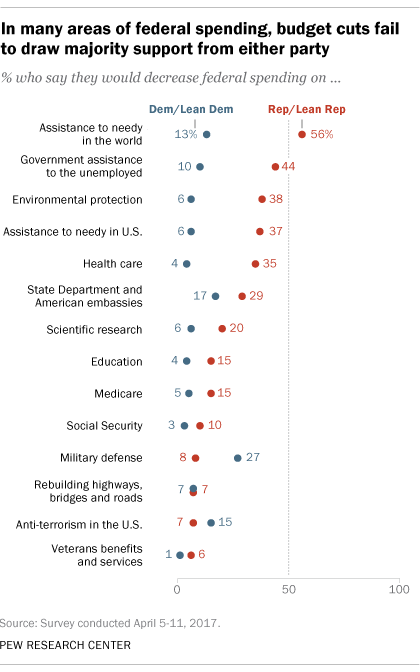 The sole area in which a majority of either party favored decreasing spending was “economic assistance to needy people around the world.” Among Republicans and Republican-leaning independents, 56% said they would reduce such funding. Among Democrats and Democratic leaners, the share who said this was 13%. This year’s survey found bipartisan support for maintaining or increasing spending for several entitlement programs. On Medicare – the health insurance program for the elderly or those with certain disabilities, which would not lose funding under the Trump budget – 85% of Republicans said they would maintain or increase spending, as did 94% of Democrats. On Social Security, which is also untouched in the budget proposal, 86% of Republicans and 95% of Democrats said they would maintain or increase spending. Although the April survey did not ask about views of federal spending overall, Americans are split in their preferences on the size and scope of government: 48% said they would rather have a bigger government providing more services, while 45% preferred a smaller government providing fewer services.